MoDOT is responsible for regulating the establishment, operation and maintenance of junkyards along the interstate and primary highway system. The Federal Highway Beautification Act of 1965 requires MoDOT to regulate junkyards under 23 CFR Section 751. Additionally, Missouri’s rules and regulations regarding junkyards are located in RSMo Sections 226.650 to 226.720 and 7 CSR 10-5. In order to maintain effective control of junkyards, an inventory system is maintained in MoDOT’s Transportation Management System (TMS). This allows staff to directly link to relevant MoDOT applications, easily update and manage junkyard traits; attach and view photos and correspondence; and generate template correspondence and reports. Failure to provide effective control of junkyards could cause the State of Missouri to lose up to 7 percent of its annual share of Federal Highway construction money as provided in 23 USC 136 (b). Additional information concerning the junkyard program can be found in EPG 236.3.8 Junkyard Control and Acquisition. Procedures have been established to enable Outdoor Advertising staff to be completely informed and able to perform their duties in a skillful manner. Each employee is a professional and must accomplish assigned duties in a professional manner. This procedure guide contains the regulations, requirements and procedural directives governing junkyard control and will be updated and amended as needed. This article is used as the policy and procedure guide for MoDOT. The contents establish a uniform method for completing each phase of the junkyard process. Written authority to deviate from the prescribed policy must be obtained from the outdoor advertising manager. MoDOT has only one standard of operation, which is applicable for all junkyard processes. Federal regulations governing junkyard control are found in 23 CFR Section 751. The Federal Highway Administration and MoDOT work cooperatively to ensure federal requirements are met to avoid loss of construction money. The role of MoDOT's outdoor advertising staff is to promote consistent business practices for the control of junkyards. This effort is achieved through cooperation with the public and other federal, state and city organizations, as well as MoDOT partnering divisions. The Outdoor Advertising Central Office is located in Jefferson City, Missouri with six area specialists located throughout the state to best serve our customers. Activities outlined in the following portions of this article and in EPG 236.16 Outdoor Advertising shall be undertaken by each outdoor advertising employee. MoDOT is responsible for regulating junkyards adjacent to the interstate and primary highway system. (Refer to the map, county map or description). This procedure provides guidance for the licensing process of junkyards in accordance with RSMo Sections 226.650 to 226.720 and 7 CSR 10-5. The application shall be time and date stamped. The information provided on the application, including involved party information, should be entered and assigned a transaction number with status “RECORDED” and reason “PENDING”; and application type “JUNKYARD” with permit status “RECORDED” and reason “RESEARCH”. The application fee shall be forwarded to the Financial Services Office for deposit (see EPG 236.17.14 Financial Transactions). Junkyard applications will be reviewed within 10 working days. If clarification of an item is necessary, a phone call may be placed to obtain clarification. The conversation may be documented in the comments section. If written clarification is necessary, the applicant may be given an appropriate deadline of not more than 10 working days to respond. If the application is incomplete, it may be rejected (see EPG 237.17.4.3 Denying a New License). The area specialist should perform a site inspection and enter this information in TMS. Original applications that have been resubmitted should be entered under the original transaction number with permit status “RESUBMITTED” and reason “RESEARCH”. If the application and site inspection meet the requirements, a license shall be issued. The status shall be changed to “CONFORMING” with reason “COMPLIANCE” and the permit status shall be changed to “ACCEPTED” with reason “COMPLIANT”. TMS will automatically generate the Junkyard License Cover Letter and Junkyard License. The area specialist shall change the expiration date to January 1 with the exception of new licenses issued during the months of October, November or December, which shall expire January 1 of the following year. The license, application and information sheet, along with the supporting documentation should be attached in TMS and filed (see EPG 236.17.15 Creating a New File). The cover letter and license shall be sent to the applicant. If the application and/or site inspection does not meet the requirements, the application should be rejected. The permit status shall be changed to “REJECTED” with the appropriate reason and the Junkyard License Denial Letter generated explaining the reason(s) for the rejection. Additional information regarding the denial may be documented in the comments section. The denial letter, application, and information sheet, along with the supporting documentation should be attached in TMS. The original application, information sheet, and supporting documentation should be returned to the applicant with the denial letter. A refund of the application fee shall be requested through the Financial Services Office (see EPG 237.17.14 Financial Transactions). This procedure provides guidance for the annual junkyard inspection process and license renewal pursuant to RSMo Section 226.670 and 7 CSR 10-5.010. 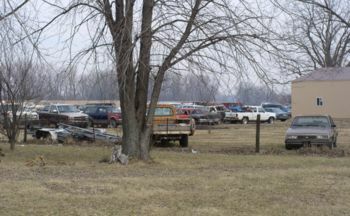 Junkyard licenses expire on January 1 with the exception of new licenses issued during the months of October, November or December, which shall expire January 1 of the following year. Junkyards are inspected October 1 through November 30 each year to ensure compliance. Beginning October 1, the area specialist shall change the status of all licensed junkyards from “ACCEPTED” to “PENDING INSPECTION” in the Junkyard Year End application in TMS. Between October 1 and November 30, the area specialist should travel the controlled routes and perform an annual inspection for all junkyards. The annual inspection, including comments, changes and photos, should also be entered between October 1 and November 30. If the junkyard is in compliance, the permit status shall be changed from “PENDING INSPECTION” to “PENDING RENEWAL” with the Junkyard License Renewal and Junkyard Information Sheet for Renewal generated and sent to the junkyard owner. Upon receipt of the Junkyard Information Sheet for Renewal and $10.00 fee (see EPG 236.17.14 Financial Transactions), the permit status shall be changed from “PENDING RENEWAL” to “ACCEPTED” with the Junkyard License Cover Letter and Junkyard License with an expiration date of January 1 generated and sent to the junkyard owner. The information sheet should be attached in TMS. If the Junkyard Information Sheet for Renewal and $10.00 fee are not received by February 1 for a compliant junkyard, the permit status shall be changed from “PENDING RENEWAL” to “EXPIRED-PENDING RENEWAL” and the junkyard status shall be changed from “CONFORMING” to “ILLEGAL-PERMIT EXPIRED”. Upon verification of the junkyard owner and address, the Junkyard License Expired and Junkyard Information Sheet for Renewal shall be generated and sent to the junkyard owner. Upon receipt of the Junkyard Information Sheet for Renewal and $10.00 fee (see EPG 236.17.14 Financial Transactions), the permit status shall be changed from “EXPIRED-PENDING RENEWAL” to “EXPIRED-PENDING INSPECTION” and the area specialist shall perform an annual inspection. If the junkyard is still in compliance, the permit status shall be changed from “EXPIRED-PENDING INSPECTION” to “ACCEPTED” with the Junkyard License Cover Letter and Junkyard License with an expiration date of January 1 generated and sent to the junkyard owner. The information sheet should be attached in TMS. If the junkyard owner fails to submit the information sheet and $10.00 fee, the 60-Day Failure to Renew Compliant Notice may be requested (see EPG 236.17.10 60-Day Notice). If the junkyard is not in compliance, see EPG 236.17.5.3 Noncompliant. If the junkyard is in noncompliance, the junkyard status shall be changed from “CONFORMING” to “ILLEGAL” with the appropriate reason and the Junkyard Violation 1st generated and sent to the junkyard owner. Any conversations concerning the junkyard may be noted in the comments section. If the junkyard owner requests additional time after receiving the Junkyard Violation 1st, a reasonable timeframe may be set. The conversation may be noted in the comments section. The area specialist may generate the Timeframe Follow-up with the agreed upon information. The area specialist should regularly inspect the junkyard and contact the owner regarding progress. When the timeframe has expired, the specialist should perform an annual inspection. If the junked items have been removed or cleaned up, the transaction shall be voided (see EPG 236.17.11 Voiding of Junkyard License). If the junkyard has been brought into compliance and the information sheet and $10.00 fee has been received, a license may be issued (see EPG 236.17.5.1 Compliant). If the junkyard has been brought into compliance; however, the information sheet and $10.00 fee has not been received, the specialist should contact the junkyard owner that a license is required. If the junkyard is still not in compliance and/or the junkyard clean-up is not progressing, the Junkyard Violation 2nd should be generated and sent to the junkyard owner. If the junkyard remains noncompliant and/or the junkyard clean-up is not progressing, the 60-Day Licensed Noncompliant Notice may be requested (see EPG 236.17.10 60-Day Notice). Junkyards are classified as recorded, conforming, nonconforming or illegal based on current statutory and administrative rule requirements for junkyards. Upon receiving an Application for License to Maintain a Junkyard and Junkyard Information Sheet, the status is classified as recorded. A licensed junkyard is classified as conforming when it meets the current requirements for junkyards pursuant to RSMo Sections 226.650 to 226.720 and 7 CSR 10-5. A licensed junkyard is classified as nonconforming (grandfathered) when a new route is controlled and the junkyard is licensed in its current condition, which fails to meet the current requirements for junkyards pursuant to RSMo Sections 226.650 to 226.720 and 7 CSR 10-5. A licensed junkyard is classified as illegal when it has violated the requirements for junkyards pursuant to RSMo Sections 226.650 to 226.720 and 7 CSR 10-5. This procedure provides guidance for the various inspection processes for junkyards. Based on changes made to functional classifications, routes classified as the National Highway System (NHS) or primary system may be added and removed for the control of junkyards. Routes reclassified and designated as part of the NHS or primary system shall be regulated for the control of junkyards. Existing junkyards located along the route prior to the designation shall be grandfathered in their current condition and required to either obtain a license or clean-up the junkyard. The route should be inventoried within ninety (90) days of notification to document junkyards with a site inspection to determine junkyard status. Junkyards that have been approved as grandfathered should be assigned a transaction number with the appropriate junkyard status and reason. If the junkyard status is “NONCONFORMING”, the reason should be “GRANDFATHER”. The permit type should remain as “PSEUDO” with status of “TEMPORARY” reason “AUTO SETUP” and the Grandfathered Junkyard generated and sent to the junkyard owner, along with an Application for License to Maintain a Junkyard, Junkyard Information Sheet, and Missouri Control of Junkyards brochure. Any conversations concerning the junkyard may be noted in the comments section. If the completed application, information sheet, supporting documentation, and $10.00 application fee is received within the 30-day inspection window, the area specialist shall issue a junkyard license (see EPG 236.17.4 Licensing of Junkyard). If the completed application, information sheet, supporting documentation and $10.00 application fee is received outside the thirty (30) day inspection window, the area specialist shall perform another site inspection. If the location still meets the definition of a junkyard, the area specialist shall issue a junkyard license (see EPG 236.17.4 Licensing of Junkyard). If a response is not received after 30 days, a site inspection should be completed to confirm the junkyard status. Further research may be necessary to confirm ownership. If the junkyard has not been cleaned-up, the area specialist should contact the junkyard owner to discuss licensing with the Grandfathered Junkyard generated and sent to the junkyard owner. If the junkyard owner fails to submit the application, information sheet, supporting documentation and $10.00 fee, the 60-Day Not Licensed Compliant Notice may be requested (see EPG 236.17.10 60-Day Notice). Routes that are reclassified and removed from the NHS or primary system shall no longer be regulated for the control of junkyards. For NHS routes, upon approval by the Federal Highway Administration and outdoor advertising manager, licensed junkyards along these routes shall be voided (see EPG 236.17.11 Voiding of Junkyard License). For primary routes, upon approval by the Missouri Highways and Transportation Commission and the outdoor advertising manager, licensed junkyards along these routes shall be voided (see EPG 236.17.11 Voiding of Junkyard License). Information regarding approval for removal of the controlled route shall be attached in TMS. Possible junkyard locations are identified through observation, complaints, or the Department of Revenue’s Dealer Salvage Report. Upon the identification of a possible junkyard, the area specialist shall perform a site inspection to determine if the location meets the description of a junkyard in accordance with RSMo Sections 226.650 to 226.720 and 7 CSR 10-5. If the location is close to meeting the definition of a junkyard, the area specialist shall create a new transaction in TMS with a junkyard status of “NON-JY” and the appropriate reason. The permit type should remain as “PSEUDO” with status “TEMPORARY” and reason “AUTO SETUP”. The area specialist should continue to monitor the site for compliance. If the location meets the definition of a junkyard and screening requirements are met, the area specialist shall create a new transaction in TMS with a junkyard status of “ILLEGAL” and the appropriate reason. The permit type should remain as “PSEUDO” and permit status “TEMPORARY” with reason “AUTO SETUP”. A site inspection should be performed with the Junkyard Violation 1st generated and sent to the junkyard owner, along with an Application for License to Maintain a Junkyard, Junkyard Information Sheet, and Missouri Control of Junkyards brochure. Any conversations concerning the junkyard may be noted in the comments section. If the completed application, information sheet, supporting documentation and $10.00 application fee is received outside the 30-day inspection window, the area specialist shall perform another site inspection. If the location still meets the definition of a junkyard and screening requirements are met, the area specialist shall issue a junkyard license (see EPG 236.17.4 Licensing of Junkyard). If a response is not received after 30 days, a site inspection should be completed to confirm the junkyard status. Further research may be necessary to confirm ownership. If the junkyard has not been cleaned-up, the area specialist should contact the junkyard owner or landowner to discuss licensing with the Junkyard Violation 2nd generated and sent to the junkyard owner. If the location meets the definition of a junkyard; however, screening requirements are not met, the area specialist shall create a new transaction in TMS with a junkyard status of “ILLEGAL” and the appropriate reason. The permit type should remain as “PSEUDO” with permit status “TEMPORARY” and reason “AUTO SETUP”. A site inspection should be performed with the Junkyard Violation 1st generated and sent to the junkyard owner, along with an Application for License to Maintain a Junkyard, Junkyard Information Sheet, and Missouri Control of Junkyards brochure. Any conversations concerning the junkyard may be noted in the comments section. If the junkyard owner requests additional time after receiving the Junkyard Violation 1st , a reasonable timeframe may be set. The conversation may be noted in the comments section. The area specialist may generate the Timeframe Follow-up with the agreed upon information. The area specialist should regularly inspect the junkyard and contact the owner regarding progress. When the timeframe has expired, the specialist should perform a site inspection. If the junkyard has been brought into compliance and an application, information sheet, supporting documentation and $10.00 application fee has been received, a license may be issued (see EPG 236.17.4 Licensing of Junkyard). If the junkyard has been brought into compliance; however, an application has not been received, the specialist should inform the junkyard owner that a license is required. If the junkyard remains noncompliant and/or the junkyard clean-up is not progressing, the 60-Day Not Licensed Noncompliant Notice may be requested (see EPG 236.17.10 60-Day Notice). Junkyard owner and landowner information should be verified prior to submitting a request to issue notice and may be determined by researching county records in the assessor’s office. A Request to Issue Notice should be generated and sent to the outdoor advertising manager for review. Upon approval, either the 60-Day Licensed Noncompliant Notice, 60-Day Not Licensed Noncompliant Notice, 60-Day Not Licensed Compliant Notice or 60-Day Failure to Renew Compliant Notice should be generated and sent certified mail to the junkyard owner and landowner. If delivery of the certified mail to the junkyard owner or landowner is unsuccessful, the notice should be delivered by hand or personal service. The date the certified mail was received, along with the certified mail number, or the date of delivery by hand or personal service should be entered under correspondence history. Certified mail receipts and green cards should be attached in TMS and maintained in the file. Upon receipt of the letter, the junkyard owner or landowner has 60 days to bring the junkyard into compliance. If the junkyard is still not in compliance and/or the junkyard clean-up is not progressing, the area specialist may request legal action (see EPG 236.17.13 Junkyard Legal Proceedings). This procedure provides guidance for voiding junkyard permits in accordance with RSMo Sections 226.650 to 226.720 and CSR 10-5.010. Photos of the location where the junkyard existed shall be taken and attached TMS. Additional information regarding the voiding shall be documented in the comment section of TMS. The junkyard status shall be changed to “REMOVED” with the appropriate reason and permit status shall be changed to “VOID” with the appropriate reason. The file should be maintained in accordance with EPG 236.17.18 Retention of Records. This procedure provides guidance for the concealment of junkyards affected by highway projects. MoDOT is encouraged to conceal any junkyards that are open to visibility due to a new highway project under RSMo Sections 226.600 to 226.720. Details concerning this process can be found in EPG 236.16.19 Sign Structures Affected by Highway Projects. The area specialist should generate the Letter to ODA Manager Requesting Legal Action and forward the request along with copies of correspondence, photographs, notes, phone conversations, inspections, deed, title commitment and visits to the junkyard to the outdoor advertising manager for review. If approved, the outdoor advertising manager should generate the Junkyard Checklist to Legal Department and forward the checklist along with all supporting documentation to the Chief Counsel’s office. The ODA manager will notify the area specialist if a case has been filed through the Chief Counsel’s office. The area specialist may be required to testify. Fees may be received within each area office or in the Central Office. A Transmittal of Money shall be completed and forwarded to Financial Services. Fees shall be deposited the day as received. A copy of the transmittal shall be kept in the area office for one year. See EPG 236.16.24 Financial Transactions. Digital photos should be taken and attached in TMS using the naming convention below. Photos can be uploaded individually in TMS under “Media”, “Add Document” or through the mass media upload process using the naming convention below. All files, correspondence and photographs shall be retained for 5 years following voiding of the license or transaction. Copies of transmittal of money should be retained for one year. It is the policy of MoDOT to comply with the provisions of Chapter 610 of the 2000 Revised Statutes of Missouri (RSMo), as amended, the Missouri Open Records (Sunshine) law. Outdoor Advertising, a section of MoDOT, implements this Open Records Policy and Procedure to respond to requests for access to junkyard records. Requests for information other than the document list, brochures and rules or regulations must be submitted on the Records Request Questionnaire. MoDOT has appointed the Secretary to the Commission as the custodian of such records as required by Section 610.023, RSMo, as amended. Requests should be forwarded to the Secretary of the Commission, PO Box 270, Jefferson City, Missouri 65102, or by fax (573) 526-5419. Outdoor advertising personnel may be required to make copies or research data to satisfy the request. After the information has been compiled, the documents should be forwarded, including amount of time spent, to the Chief Counsel’s Office. The Chief Counsel’s Office will review the information and the costs calculated will be billed to the requestor. The information will be forwarded to the requestor after payment is received. The Chief Counsel’s Office maintains copies of all requests indefinitely. This page was last modified on 2 January 2019, at 13:51.